Daily Illuminator: May 2012 New Releases! February 17, 2012: May 2012 New Releases! 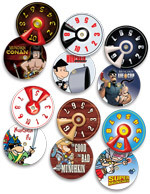 New for May, six new colors of Cthulhu Dice and more Munchkin level counters! One large custom die, 18 glass marbles, baggie, and rules. Stock #131327, UPC 8-37654-32158-4. $6.95. Six level counters in a plastic bag. Stock #5541, UPC 8-37654-32151-5. $9.95.